The new pier and cruise terminal of Charlottetown opened on September 25th, 2007. On occasion, when more than one ship is in port, tenders to the same terminal will be used. The ships will dock right downtown. Moments after stepping off the ship in the beautiful and historic city of Charlottetown, you’ll be strolling the same streets the Fathers of Confederation did before Canada became a country. Celebrate Canada's history in Charlottetown in a fun and unique way. Follow in the footsteps of our Fathers of Confederation and experience history first hand! Stroll down one of Canada's National Historic Streets, where every building and street corner tells a story. Join Canadian heroes like Sir John A MacDonald, Sir George Etienne Cartier and other historical figures as you stroll through the streets of Charlottetown un-discovering the Birthplace of Canada. Canada's Birthplace, tells the story of this great Nation like no other. Spend a day in Charlottetown taking in our history and experiencing our culture. See the colorful, painted buildings; duck into the quiet back streets, and trace the city's graceful passage of time. Visit Founders' Hall – Canada's Birthplace Pavilion where visitors are transported back in time through the "Time Travel Tunnel" and walk through the pages of Canadian history; starting with the Charlottetown Conference in 1864 and concluding with the joining of Nunavut in 1999. Founders' Hall makes learning history fun and entertaining. Continue your journey with a guided walking tour in the Historic District with the Fathers and Ladies of Confederation. Walking tours depart daily (June - September) from the Charlottetown Visitor center at Founders' Hall. From Founders' Hall, make your way to Historic Great George Street. It's worth the stop to St. Dunstan's Cathedral Basilica, one of many great churches located throughout the city. 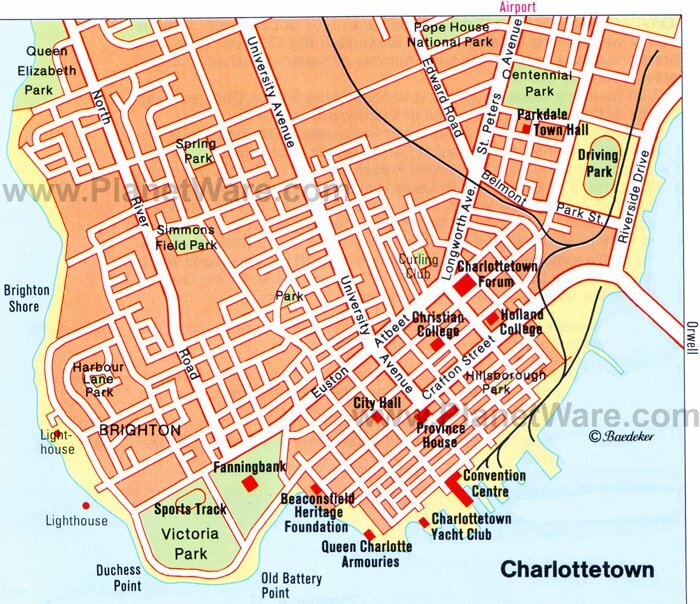 Charlottetown contains two major shopping centers: the Confederation Court Mall (right downtown, across from Province House), and the Charlottetown Mall, which is just out of town in West Royalty, on University Avenue. They contain the usual anchor stores (Zellers, SportsChek, etc), as well as many smaller stores. West Royalty also has many stand-alone big-box stores, such as Wal-Mart, Canadian Tire, Future Shop, etc. You will find ATMs in many grocery stores, malls, airports and so on, and most are linked to the international networks, the most common being Cirrus, Plus, Star, and Maestro. You can also grab cash from an ATM if you use a major credit card although this method tends to be more expensive because, in addition to a service fee, you'll be charged interest immediately. Founders' Hall, across the terminal, offers free wireless Internet.